Cheapfaremart, the leading ARC-certified travel agency, has made it easier for you to search Golfito flights, compare Golfito flight deals available with multiple carriers and book the cheapest flight tickets. What is the Best Time to Visit Golfito? The proximity of Golfito to the Caribbean Sea and the Pacific Ocean contribute significantly to its pleasant tropical temperature. The cool breezes of the aquatic surroundings neutralize the equator heat. 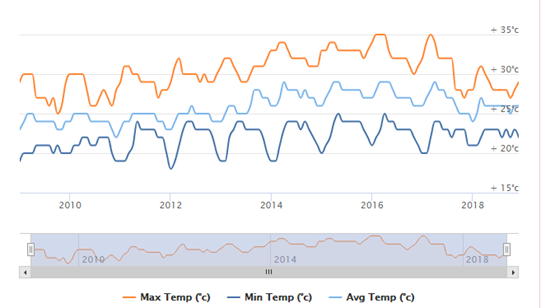 The average temperature in Golfito stays around 77 °F (25 °C) around the year. Barring the wet season of July, August, and September, every time is the best to visit Golfito. However, if affordable travel is on your mind, this is the best time to visit. Airlines drop off their prices, and it’s easier to book cheap plane tickets to Golfito. 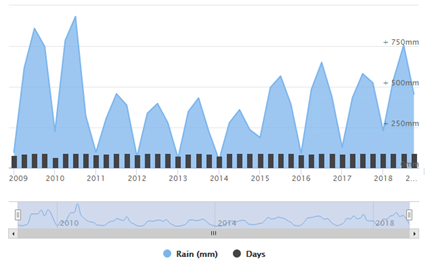 The rainfall in Jan-March 2018 was 250 mm while in between July and September it was recorded as 750 mm. The place doesn’t receive any snow. What are the Top Things to Do in Golfito? If you are a bird lover, Corcovado National Park is the place to be. Approximately 30 miles from Golfito, the park is home to 104 mammal species, 367 birds, 117 amphibian and reptiles, and 40 species of freshwater fish. Meet 800 butterfly species and 2,000 plants and flower species at Wilson Botanical Garden. Want some time for yourself? Camp on Playa Zancudo. Take a stroll along the 6 miles of untouched, remote sandy beaches. Who knows musing with ocean waves and breezes can bring the dormant artist alive in you. Trail walk the dense rainforest behind the Golfito Marina Village. Test your endurance hiking the rough terrain. You don’t need to compete. Hike with your own pace and enjoy the ascent. There are beautiful waterfalls to grab your attention. The place is favorite of bird watchers, photographers or adventure lovers. Gallop along deserted beaches or ride to the hilltops with sweeping views of the Pacific Ocean. Wondering about getting a horse? You can rent it from Golfito Marina Village and Resort. Take a ride through the rainforest and get the best view of Costa Rica from the treetops. This adrenaline rushing experience is the favorite of visitors. However, you must give attention to the safety directions of your guide or tour operator. Golfito Airport (IATA: GLF, ICAO: MRGF) is the only airport. It’s a domestic airport. If you are flying from the US cities, your plane has to land to any of the three international airports in Costa Rica – Tobías Bolaños International Airport (SYQ), Juan Santamaría International Airport (SJO) and Quepos La Managua Airport (XQP). We have taken Golfito airport just for reference only. All international flights from US will depart to the mentioned international airports only. From there, you can find flight to Golfito, which may take around 45 minutes. How Much Does a Flight to Golfito Cost? Airfare to Golfito from some popular airlines we have displayed on the top. However, they are based on past trend and are subject to change. To know about the current best airfare deals to Golfito, perform a flight search with our flight booking engine. You may customize your search with one-way, round trip, nonstop, one-stop or two-stop options. Why Book Airline Tickets to Golfito with Cheapfaremart? Hope you found the best airfare deals to Golfito. For any help regarding finding the best fares, flight routes and reserve your flight, call us on 1-844-869-5222 (Toll-Free).